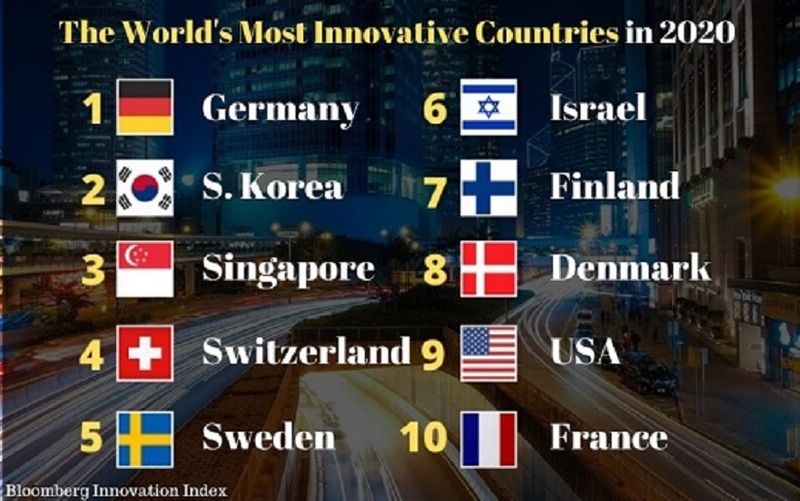 Despite being a relatively young country, Israel is considered to be one of the most entrepreneurial and innovative countries. Consequently, Israel serves as a role model for many other countries. 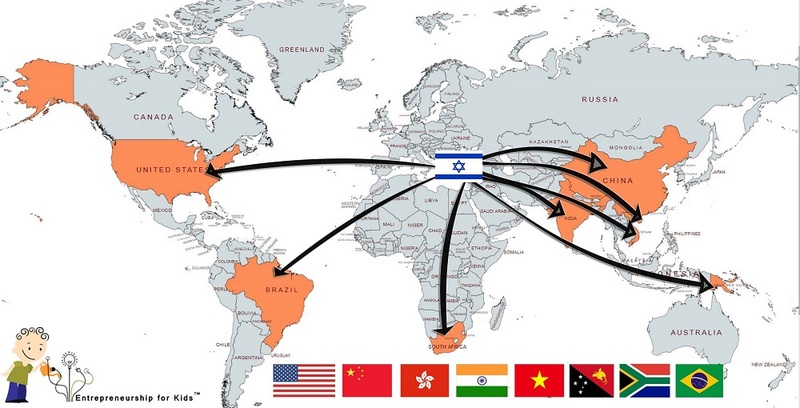 As a leading country in innovative and entrepreneurship, Israel hosts delegations of investors, entrepreneurs, educators, companies, governments, and others from around the world. They all come to learn "the secrets" that turned a small country into a start-up nation. Many have tried to understand the Israelis' entrepreneurial mindset and culture. Some attribute this entrepreneurial ability to the integration of various cultures in one small country with characteristics such as eagerness to learn, opportunism, creativity, rebelliousness, audacity, ambition, etc. Others see Israel, with so many entrepreneurs and inventions as a wonder that worth taking an interest in and trying to learn from. Along with the impressive achievements, Israel nurtures entrepreneurship education from an early age in the K-12 education system. Israelis believe that to cultivate entrepreneurial skills in children, we should expose them to innovative ideas, inventions, and experienced entrepreneurs. Doing so, encourages children to aspire to leave their mark on the world. Exposing children to innovation opens their eyes and helps them to understand the potential in entrepreneurship. For this purpose, we prepared a presentation for the Global Entrepreneurship Week, which is celebrated in schools that provide entrepreneurship education. It illustrates that Israel is a start-up state. Entrepreneur skills - Those that desire to be entrepreneurs will find on this website a set of qualities and skills required of an entrepreneur to succeed. Examples of various entrepreneurs and initiatives from Israel and around the world can also be found on this. We hope website visitors will not only learn how to be an entrepreneur through this website, but also be inspired to become one. Personally, the information on the site helped Galit Zamler take inspiration from other entrepreneurs and overcome crises that she experienced with the various projects that she led and was part of. Entrepreneurship for Kids Program - Those who believe in entrepreneurship education from a young age, will find on this website an assortment of online content, applications, and examples of entrepreneurship education for elementary schools, middle schools, and high schools (k-12). Lectures - Those who are interested in ordering online lectures on entrepreneurship, entrepreneurship education for students k-12 about innovation in Israel, are invited to contact Galit Zamler. Why Should Schools Teach Entrepreneurship? Teaching kids entrepreneurship is about fostering an entrepreneurial mindset and ensuring that students learn skills essential to success in the 21st-century. Israel is known as a start-up nation, which sometimes raises the question: Why does one need to learn entrepreneurial skills? Since so many successful initiatives originated in Israel, perhaps entrepreneurship has been something natural that is somehow built-in to the Israeli genetic code and there is no need to teach how to be an entrepreneur or to learn entrepreneurship? - Entrepreneurship education does not mean everyone should be entrepreneurs since, in practice, most adults are employed, but the qualifications that are learned through the entrepreneurial learning process are important skills for the success of everyone, either as an employee or as an entrepreneur. Moreover, nowadays, employers are looking for hiring workers with entrepreneurial skills. - Entrepreneurship plays an important role in improving the country's economy, increasing employment, and reducing unemployment. Hence, investment in entrepreneurship education from an early age is worthwhile because it has a real payoff at the national level. - Increasing the chances of success of future entrepreneurs. - Reducing the gap between male and female entrepreneurs. - Make the benefits of entrepreneurship accessible among disadvantaged populations such as those of a low socioeconomic status to help get them ready for future jobs. - Entrepreneurial qualifications are skills that everyone must learn to deal with the various challenges of the 21st century. 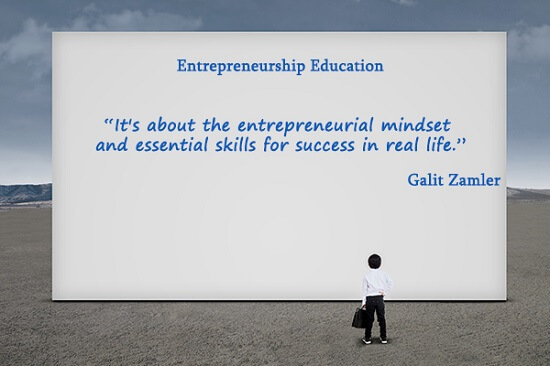 After all, entrepreneurial skills are life skills. - Raising the rates of those who dare to be entrepreneurs and who are not afraid of failure. These can also be intra-enterprise entrepreneurs. Encouraging innovation and developing new ventures depends on us. Specifically, it depends on how we encourage our children to be entrepreneurs and acquire entrepreneurial skill sets. If we teach children how to be entrepreneurs at a young age, we can introduce them to the entrepreneurial culture and equip them with tools and knowledge that will help them in life, empower them, and build their self-esteem as well as self-confidence to dare to fulfill their dreams. The Israeli Professor Dan Shechtman, Nobel Prize winner in Chemistry, supported this perspective, saying: "Entrepreneurship studies are vital to any sort of country that wants to survive the world whose natural resources rapidly deplete." Educating children about entrepreneurship from a young age is effective and appropriate when the perception is that most of the qualities of the entrepreneur can be acquired. Given that perspective, the environment has an important role and a great influence on the individual. On a personal level, entrepreneurship education also considerably empowers children individually by improving their chances of success in life and increasing their confidence in the fact that they are capable succeeding in any field they desire, regardless of academic achievements (Although, cultivating entrepreneurial abilities definitely encourages learning, curiosity to know and to explore). Allegedly it is obvious: An entrepreneur is a person who takes a concept and controls its implementation. In practice, the definition is much broader. Almost all of us have ideas, but for many of us, the ideas remain a thought and a dialogue that we unable to put into practice. The difference lies in the characteristics, skills, knowledge, and experience that the entrepreneur has acquired throughout his life. Being an entrepreneur means having capabilities that are essential in a challenging and changing world. Among the skills of an entrepreneur you may find: A visionary and a focus on a purpose, determination and perseverance, courage to dare, courage to fail and try again, the ability to learn from mistakes, the desire to learn and grow, high self-esteem, belief in oneself, belief in one's own abilities, the ability to lead, optimism, practicality, the ability to plan, the ability to manage economically and stay within a budget, social and communication skills, oral and written communication skills, respect for others, attentiveness, the ability to be responsible and taking responsibility, patience, ability and willingness to handle challenges, the ability to identify opportunities, willingness to acknowledge of others who think differently, creativity, the ability and willness to enjoy creating something, the ability to ask for help, the ability to manage yourself and others, the ability to take calculated risks, ability to make the distinction between the wheat and the chaff, self-motivation, flexible thinking, realism, negotiation, ambition, self-discipline, work as a team, and the desire to make a change. The skills required for an entrepreneur are life skills that each of our children should have to some extent to succeed in life and in the labor market. Most of the skills required for entrepreneurship can be acquired and children should learn them from an early age so that they can adopt new abilities and behaviors relatively easily. Students participating in our entrepreneurial program learn to understand the importance of entrepreneurial skills. Moreover, via theoretical and experiential learning, students internalize and adopt these qualities. 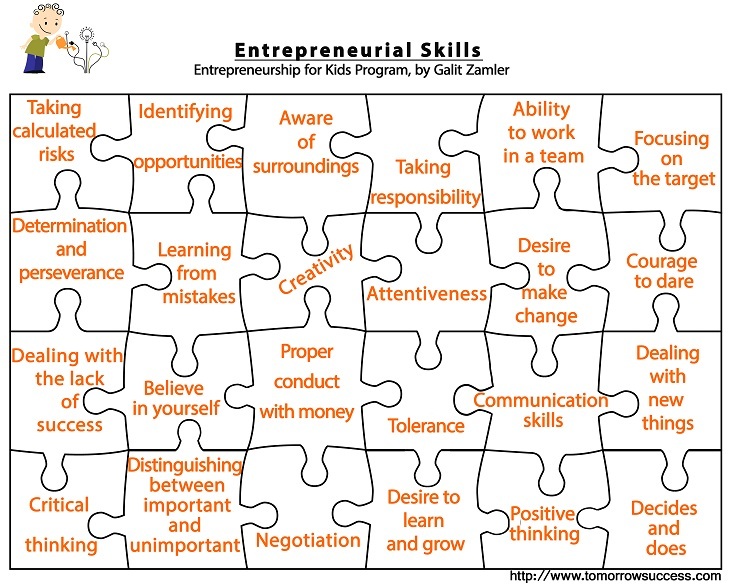 This puzzle of entrepreneurial skills is part of the program and we use it throughout the year. Specifically, we utilize these skills when we learn about the various features of the entrepreneur. You can download and print this puzzle for lessons in entrepreneurship with your students. This entrepreneurial program for schools was developed in recognition of the need to teach students entrepreneurial skills from an early age. In recent years, officials of the educational system in Israel and around the world have come to this conclusion. The program was developed in accordance with the schools, to encourage school administrators and teachers, who do not come from entrepreneurial backgrounds, to serve as mentors for students. Mentors provide relevant knowledge to young entrepreneurs, guiding them through the entrepreneurial experience while encouraging them to have fun and to believe in the ability of each and every student to succeed. As part of the program, students learn to identify opportunities, propose ideas for projects, plan out the implementation of projects, take responsibility, set and achieve goals, collect and analyze relevant information, convince others of their ideas, believe in themselves and their abilities, deliver compelling speeches in public, make financial calculations, be sensible consumers, solve problems, be creative, work as part of a team, develop social skills, develop independent and positive thinking and much more. The program encourages students to develop entrepreneurial competence through a meaningful and experiential learning process by using lectures, discussions, presentations, videos, exercises, and most notably implementing projects developed by the students themselves. The program combines professional theoretical knowledge of the entrepreneurial world with practical experience which is applied to the students' projects. This combination trains students and provides them with the necessary tools to succeed as future entrepreneurs, if they chose to follow that path. The k-12 entrepreneurship program was first implemented in Israel in 2009 and is considered to be one of the most successful programs for teaching kids entrepreneurship within a school setting. Schools outside of Israel that are interested in using the program are welcome to contact Galit Zamler. The EFK program is also taught in the USA, China, Hong Kong, India, Vietnam, and Botswana. The guiding principle in promoting the program in schools is that the future of each country and its citizens depends mainly on the education, tools and skills we provide to our children. Why schools should teach entrepreneurship?